Ah, good ol’ Iron Maiden. Even though Die with Your Boots On (1983) is not their most popular – or best – song by far, it does make for an interesting mix of rhytmic trivia in The Endless Chorus. Or rather, the tiny portion of it that’s featured in the prototype of said game does, tasking players with filling lyrical gaps in a timely manner. Groovy? Hell yeah! Prior to starting a new game, you have the choice of two difficulties, and let me tell ya… hard is just that, leaving little room for mistakes. Easy gives you one chance – per letter in the current word – to grab those juicy bonus points/stamina, while on hard, either you nail it or you don’t. Oh, and on top of that there’s a time limit – miss a word completely, or guess wrong, and your stamina will be reduced. Lose it all and it’s game over. A simple enough concept, although prior knowledge of the lyrics does obviously provide a sizeable advantage over having to replay and memorize. Something I suspect is only going to be further emphasized if/when a more fleshed-out version becomes available. 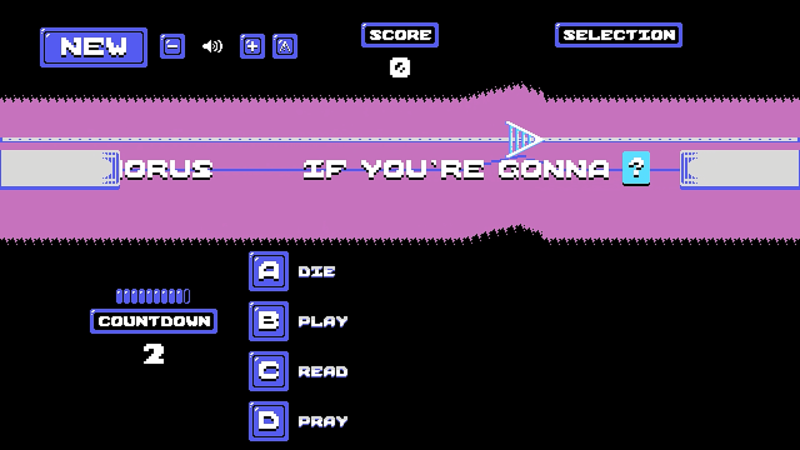 That’s not to say what’s available is destined to be a brief experience though, as modding support has been implemented, enabling players to create their own levels/lyrics with ease in The Endless Chorus. Rock and roll! The Endless Chorus is available from itch.io.